Разстояние до летището 15,3 км. Имате въпрос към Lahiru Villa? Lahiru Villa е благоприятно място за почивка и отмора след напрегнат ден, добре разположен в плажове, култура, разглеждане на забележителности зона на град Гале. Вълнуващият център на града е само на 2 km оттук. С удобното си местоположение хотелът предлага лесен достъп до всички градски забележителности, които задължително трябва да се видят. Lahiru Villa предлага безупречно обслужване и необходимите удобства, за да удовлетвори гостите си. Подбор на съоръжения от най-висока класа като 24-часов рум-сервиз, експресно настаняване/напускане, Wi-Fi връзка в общите части, паркинг, рум-сървиз, са на разположение за Вас в хотела. 4 стаи са разположени на 3 етажа като във всяка една от тях цари неповторимото усещане за домашен уют. Модерен комфорт с удобства като телевизор с плосък екран, стойка за дрехи, уелкъм дринк, спално бельо, огледало са на разположение в определени стаи. Хотелът разполага с голямо разнообразие от развлекателни съоръжения като градина. Насладете се на несравнимото качество на услугите и престижното местоположение на Lahiru Villa. Мы останавливались на 2 ночи в надежде побыть у океана, но океан совсем не рядом, т.к. Напротив огромный отель и нам пришлось покупать там гостевые пропуски за 10$ на человека (лежак, полотенце и бассейн). Отель находится далеко от магазинов и кафе, нужно брать тук-тук, пешком не дойти. В номере было очень душно, кондиционер не работал, вентилятор гонял горячий и спертый воздух, в номере пахло сыростью, розетки искрятся, одеяла не было. Мы бы не рекомендовали специально останавливаться в этом отеле, прям только если на крайний случай и то только переночевать. Our family of five had a wonderful stay here. The owners are incredibly generous and kind – driving us around in their tuk-tuk and showing us the sights of Galle and Unawatuna, entertaining our kids and serving us delicious Sri Lankan food for breakfast and dinner. We stayed on the top floor of their guesthouse in a good-sized room with a balcony that had gorgeous views over palm trees and out to the ocean. This is one of the best places we've stayed in our three months of travel around Asia and I can't recommend this wonderful guesthouse more highly. This Villa was amazing. The room had a lot of space, the bed was very comfortable and the shower had good hot water. Liked the fact that it had a mini fridge. The break was unbelievable l...we were served coffee or tea, fruit, bread, eggs, marmalade...couldn't has for more than that! Too top it off the husband and wife were so personable and friendly. They gave us lots of information on how to get around the country. Would recommend this stay to anyone! Would definitely come back here again. Thank you! Отседнахме 2 вечер/и в август 2018 г.
great food. clean room. awesome hosts. excellent value for money. quiet place just outside busy part of Galle, but only a quick bus or tuktuk ride away. we loved the balcony meals with sea view. thank you for welcoming us to Sri Lanka! We had awesome two nights in lahiru villa. The family always helped us and even bought some fish with us which we could enjoy at the highest balcony in the villa. We really recommend this place. Very nice place and super nice hosts. Husband will organize trips for you in his tuktuk. Wife will make you an excellent rice and curry dinner. Would definitely stay again. It’s a little distance from town. Our room a t Lahiru villa was fine with a balcony looking out over the sea. The breakfasts were excellent and the fridge was a bonus. Our hosts were very friendly and helpful with a free ride into the station on leaving. Generous breakfast, warm treatment. The owner was very kind and sincere. He took us around Galle and even sent us to the railway upon check out without wanting to take a token from us. We felt safe staying in Lahiru. Its 2km away from the busy area so its peaceful to sleep. Would definitely recommend! The owner was really lovely and helped us with everything. He even took us on a ride with his tuk tuk. The food from his wife was very tasty. The prices for accommodation and food are also very reasonable. We travelled as a group of 3 couples and had a lovely time for our 4 night stay here. The hosts were so welcoming with fantastic knowledge about the area, on our final day we rose early and our host, a naturalist, took us out on the river for a wonderful bird safari - highly recommended! We ate lovely breakfasts on the terrace and had a delicious home cooked curry one evening. it was incredibly easy to zip into atmospheric Galle Fort on a Tuk tuk. The very nearby jet wing lighthouse is surprisingly reasonable for beers overlooking the crashing waves. The rooms were very comfortable and a good size. We found it to be the perfect place. A little bit far from the Galle fort, its only 4 km to fort but its not a nice walk. Room was acceptable but nothing special, smell of humidity inside and ventilator was broken. 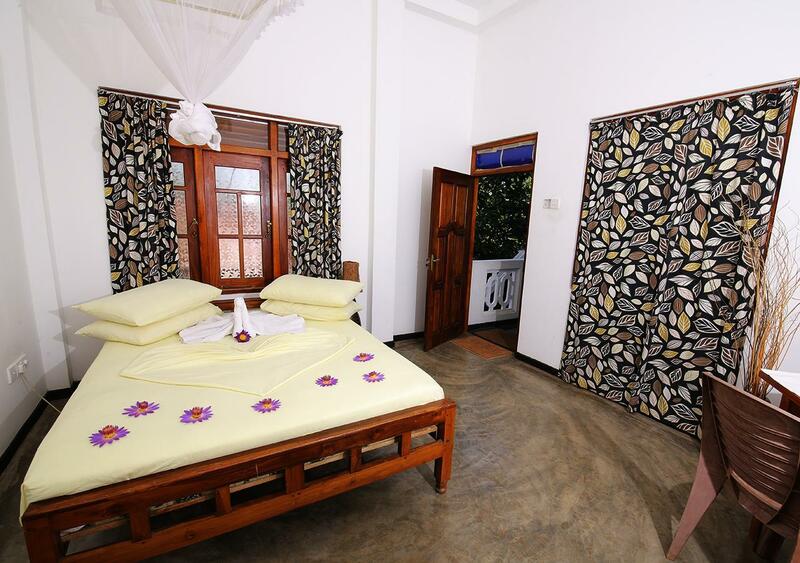 We stayed three nights at Lahiru Villa. It is run by the owner and his family, which were all very friendly and helpful. The rooms are clean, have a quiet AC and a private bathroom. Galle Fort is a 5min drive by tuktuk. 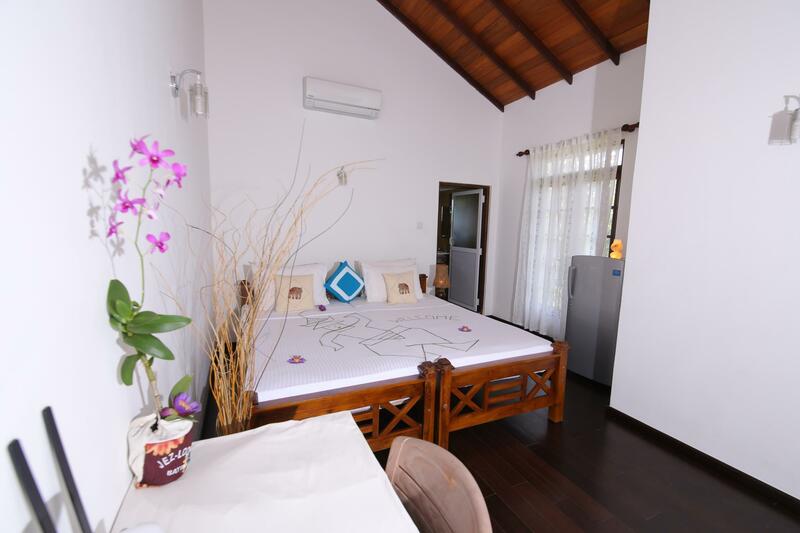 Another plus is that the Jetwing Light House is opposite Lahiru Villa, where you can use the facilities (beach/pool) for a small fee. The owners are really nice and helpful! They will prepare for you home made curry (yummy!!) and show you best places to buy spices and souvenirs. For those who don't have set plans, they are eager to propose cool activities - turtles preservation spot is quite interesting! And room on the top floor has got amazing view! Highly recommended! We stayed in villa from nov 13 to nov 20. The warm welcome from the hotel owner made you feel like home. We Knew that there are a lot to do in Sri Lanka. The owner is so helpful, giving us so much advices and helping us to plan our week in Galle. And he is also a professional diver who's familiar with the local sea here. So he took us to a diving center owned by one of his best friends. We had a great diving tour together around the Unawatuna area. It is one of my best diving experience. Then the next day he Drove us to the yala national park for the jeep safari where you can see a lot of wild animals including Eagles spotted deers cocodile elephants peacocks etc. So here is definitely a place you should stay in Galle. Rooms are clean with air conditioner / hot shower and the price is fair. Also the Owner is friendly and easy going. He is able to get all the activities you wanna do here well planned. Also his wife is a good cook, you must try her homemade Sri Lanka curry super yummy!!! Stayed here for three nights. Lovely owners who accomodated for any need we had! Lovely breakfast and fantastic river safari at excellent price! Even dropped us to our next hotel for a cheap rate via tuk tuk. Only issue is that if you are staying here you need to get a tuk tuk to get around galle as the walk can be abit much especially in the heat. The owner organised an other accommodation as he could not host us because of the funeral of a family member. That was very professional.